There’s never a dull moment at home. Wouldn’t it be great to get some extra help there? You could start up your favorite song while you’re washing dishes, turn off the lights without getting out of bed, or check the traffic when you’re running out the door. Today we’re unveiling a new product that helps you in the place you need it most: your home. With Google Home, it’s as simple as using your voice to turn up the music, get answers to a myriad of questions, manage tasks around the house, and even adjust the thermostat or lights. It allows you to bring the Google Assistant into your kitchen, living room or anywhere else around the house. With a simple “Ok Google” you can play songs, artists, radio stations, your favorite playlists and more from Google Play Music, Pandora, Spotify, TuneIn and YouTube Music with additional services like iHeartRadio coming soon. You can also play a podcast while making pasta or listen to today’s news while tying your shoes. And if you just want to stream audio directly from your phone, you can cast music to Google Home from 100+ Chromecast-enabled apps on your Android or iOS device. 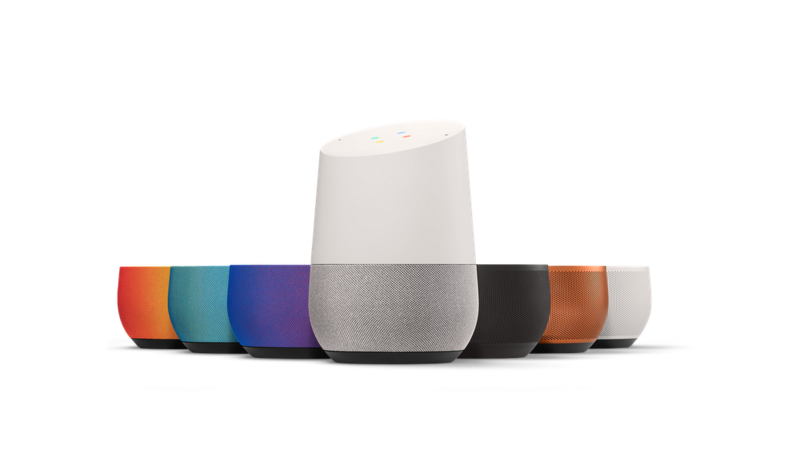 Google Home’s smart audio design integrates a high-excursion driver with a dual passive radiator design that delivers crystal-clear highs and deep lows for Hi-Fi sound that streams over WiFi. That means a lot of big sound from a small package. Even while you jam out to music, it can easily hear you from across the room, thanks to two omnidirectional microphones and neural beamforming. Google Home taps into the power of Google Search to give you real-time answers to things you want to know. Ask Google Home to translate phrases and do simple math calculations. Kneading pizza dough and need to change ounces to grams? Ask and get unit conversions and nutritional info, too. Getting ready for the day? Get real-time info on the weather, the stock market, the traffic, or your favorite sports team. Google Home can also help you find answers to more obscure questions directly on the web. It’s all the power of Google with a simple voice command. With your permission, Google Home makes helpful information easily accessible. Check your calendar or even pull up your flight information. You can also say, “Tell me about my day” to hear curated personal information that helps you navigate your day. We know there’s no shortage of tasks at home, and Google Home can help with those too. Ask it to wake you up in the morning, set kitchen timers, and keep track of your shopping list. With Google Home, you can control devices around the house. Play and control music on your speakers that have Chromecast Audio plugged in or Chromecast built-in. Or stream videos to a TV equipped with Chromecast. At launch, you can fire up videos from YouTube, and we’ll support popular apps like Netflix and Google Photos in the near future. You can also control your lights, thermostats and switches with popular home automation systems like Philips Hue, Nest, Samsung SmartThings and IFTTT — with more coming soon. We designed Google Home to look good. The top blends into your home with a clean, minimal design that has no buttons and hidden LED lights. It features a capacitive touch surface for those rare moments when voice won’t do. Because every home is different, you can customize the base with different colors and finishes (metal and fabric, sold separately) to your personal taste. Want to enjoy music throughout your house? 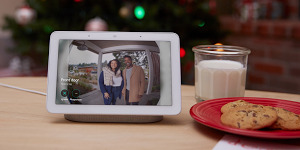 Build up a team of Google Home devices and blast the same tune in every room with Multi-room (you can also group with Chromecast Audio or Chromecast built-in speakers too). Having more than one device doesn’t mean they will all respond when you say “Ok Google.” If they have the same user account, only the closest one responds. Big or small. Modern or minimal. How you arrange your home is up to you. But when it comes to the other stuff, Google Home is happy to help. *Device purchase required. New subscribers only. Terms apply. Offer expires 12/31/16.